Since I'm that nerd who reads liner notes, it was a pleasant surprise to see my name in the credits for Sonia's most recent album. It's not a big secret that I'm a tireless supporter of Tetlow's music and I hope I'll do A Place For Everyone enough justice to earn my place on the album's inside jacket. Sonia brought her usual supporting cast on board for this release: Paul Sanchez, Mary Lasseigne, and the various members of Roxie Watson. (PS -- Many of those people contributed to Proud, my charity benefit compilation CD and you should totally drop a Hamilton on it.) But the band didn't just bring their instruments -- it sounds like they packed the whole damn city of New Orleans. 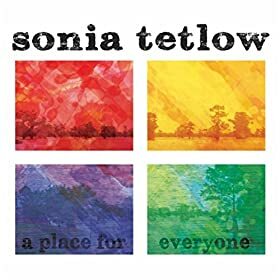 A Place For Everyone is an investigation of balancing Sonia's New Orleans with the life she's built in Atlanta. It starts with her account of having to take a final exam on Mardi Gras morning in an environment that just doesn't get it, and ends with "Comfort and Light," a meditation on personal growth. This album more clearly bears the country and Americana influence she's been exploring with Roxie Watson than her previous album, Own Way Home. However, I still think Sonia's at her best with her epic rock songs like "Bosom of Abraham," a magisterial piece that enlists no less than the harmonies and mandolin of Amy Ray herself. If I may submit a gentle critique, it's that A Place For Everyone is not as consistent as her previous releases. While the songs are unified by theme, they feel a little schizophrenic musically. While most of the songs grabbed me, some of them left me hanging. That's to be expected of someone as prolific as Tetlow, though, and, as always, when her music is good, it's out of this world. Just in case this wasn't long enough, here are two causes worthy of your money. 1) Preorder John Moreland's upcoming album!